Cisco Air Systems provides several types of industrial vacuum pumps for food, beverage, printing and general manufacturing needs. We’re a distributor for Elmo Rietschle vacuum pumps. Elmo Rietschle is a recognized leader providing vacuum pumps to industries throughout the world. Get in touch with us if you are looking for the best choice of products and technologies, outstanding quality and expert know-how for all applications requiring vacuum or pressure. We focused on finding and delivering solutions that will make your manufacturing processes faster, safer and more cost-efficient. Contact our sales department at (888) 491-4011 or email us at info@ciscoair.com if you have questions or do not see what you are looking for. 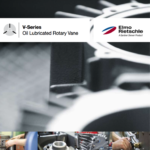 Please fill out the form below to download the Vacuum Pumps brochure.